Carine Masters has been running the Australia Day Swim since 1991. It has become one of the most popular on Perth's summer open water swim calendar. Doing the 2km swim at Perth's iconic Scarborough beach is a great way to start Australia Day. 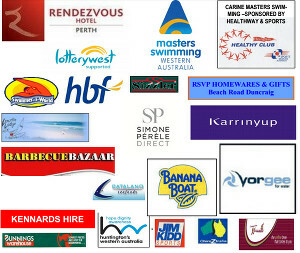 We are grateful for the generous support provided by a number of Perth businesses and encourage our swimmers to support them. Part proceeds of the Australia Day Swim are donated to Huntington's WA. Huntington's Disease (HD) is an inherited disease affecting areas in the brain which control, movement, thinking and emotion. It slowly gets worse and there is no known cure.